I haven’t posted here for a while, but to celebrate the advent of reduced-clue skyscraper puzzles on PuzzleMix.com earlier today I thought I’d post a few Skyscraper puzzles here. Skyscraper puzzles combine the no-repeat row and column constraints of sudoku with novel additional clues. 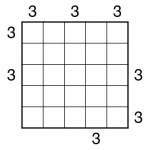 In these 5×5 puzzles, place the numbers 1-5 once each into every row and column. Each number in the completed grid represents a building of that many storeys. Place the buildings in such a way that each given number outside the grid represents the number of buildings that can be seen from that point, looking only at that number’s row or column. A building with a higher value always obscures a building with a lower value, while a building with a lower value never obscures a building with a higher value. This entry was posted by Gareth Moore on May 13, 2013, and is filed under Skyscraper. Follow any responses to this post through RSS 2.0. You can leave a response or trackback from your own site. Sum-Skyscraper 5×5 puzzleI made this puzzle just before Christmas, and it’s been waiting on my desktop to be posted here ever since! Well, now it finally has been. Following-up yesterday’s Skyscraper puzzles, I thought I’d post a couple of Sum Skyscraper variant puzzles. I’ve just added Skyscraper puzzle support to Puzzlemix. Hop on over if you’d like to try playing Skyscraper puzzles online! This means that there are now 16 different types of puzzle on the site, plus a variety of sizes for each of those puzzle types. It’s been a while since I posted a new puzzle here, what with all the excitement about Sudoku Xtra magazine, so I thought I had better do something about that right now! So to that end, here’s something a little bit unusual – a Consecutive Skyscraper puzzle. Continuing my series of 8×8 Skyscrapers and variants, here’s an 8×8 Sudoku with Skyscraper clues around the edge. Here’s a combination I haven’t posted before – a standard skyscraper puzzle with the addition of consecutive markers between adjacent squares. This allows the creation of an 8×8 puzzle without needing to also add Sudoku boxes. It occurs to me that I didn’t get round to posting any ’straightforward’ Skyscraper Sudoku puzzles previously, so I thought I’d rectify that today. 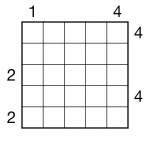 Attached is a regular 9×9 Sudoku with the addition of Skyscraper clues around the edge, and no other twists!